What’s just as exciting as strolling down the red carpet come Oscar Season? Product placement producer Debbie Durkin’s annual EcoLuxe Lounge event. On Saturday February 21st at the Beverly Hilton’s Stardust Penthouse, Durkin once again honored the film community and introduced a bevy of exciting new luxury eco-friendly brands in a fantastic day-long event. The beautiful roof top venue was styled by glamping and event rental specialists Under Canvas, with stellar support from Elan Event Rentals, LBPS Events, and Frances Lynn Creative Florals. The view from the penthouse deck was provided by the clear blue skies of Beverly Hills. Attendees included Oscar nominees and winners such as Ben Wilkins – who received the Oscar for Best Sound Mixing on the indie favorite Whiplash, Elise Roberston, Elizabeth Yianni-Georgiou, The Theory of Everything producer Lisa Bruce, Hercules star Kevin Sorbo, Frank Stallone, Nia Peeples, Carolyn Hennesy and many more Hollywood guests representing films from Guardians of the Galaxy to American Sniper. Mimosas, champagne, and trays of delicious eats from spinach quiche to stuffed mushrooms rotated through the room, while VIPs grooved to the mixes of DJ Dime. Guests were treated to a styling bar, organic spray tans, and make-up from OC Hair & Makeup, who also gifted gorgeous O.P.I. nail polish and trendy HAI MP3 flat irons that can hold two hours of music. Never get bored while styling your hair again! Under Canvas offered luxury tent event rentals and glamping vacation options from deluxe safari tents to tipis perched in some of the most stunning locations in the U.S., including Glacier National Park, Yellowstone National Park, and Moab, Utah near Arches National Park. Having glamped myself on several occasions, these offerings look like an amazing addition to this vacationing style. Need to bring your four legged friend along on your travels? CanaDog Supply had guests fixed up with sleek #DogPower T-shirts, collapsible and portable water bowls, leashes and collars. Beautifully crafted KD Pet Protector charms were another pet-centric item sure to please pets and their humans alike. And should Fido need to stay home, Gardena-based Camp Run-A-Mutt provided gift certificates for free doggie daycare. There were also gift certificates for hand crafted dog collars by Let There Be Collars, and complimentary services at Animal Healing & Wellness including healing Reiki for dogs and cats. 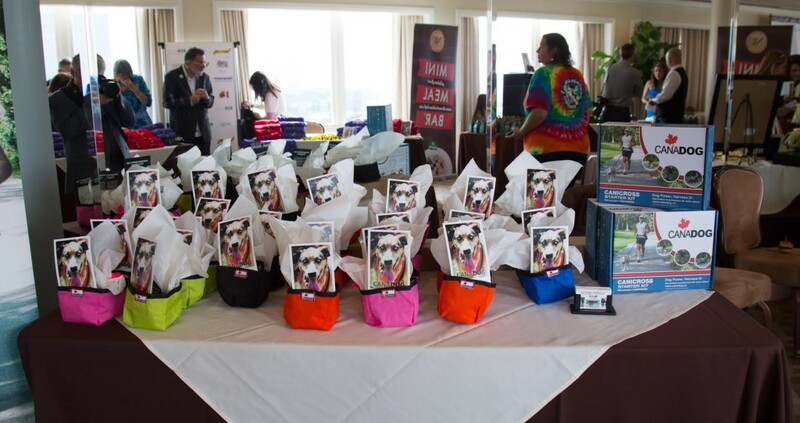 Holistic Pet Solutions products were also served up with style. For a scented refresher, BluBond offered lovely and soothing rose water – wonderful as both an addition to a drink and for skin toning. Need nutrition? Chef Alex Fioroni and his marketing coordinator Ingrid Fioroni handed out boxes of incredibly delicious brownie and chocolate chip protein bars. Unlike mass produced counterparts, these were vegan, organic, and addictively fresh tasting. Gift bag items included a Café Press bag packed with Go Go Squeez apple sauce, gluten free Modern oats, and fragrance from Loree Rodkin. To enhance guests’ spiritual side, there were gift certificates for complimentary meditation sessions at Body & Brain Yoga in Burbank. The Sugar Mint Candle Company provided gift vouchers for their hand-poured 100% soy candles, imbued with fresh fragrance and essential oils. Can’t wait to burn my paraffin-free creation. I chose the original, eponymous sugar mint scent. Event sponsor Choices Recovery, a substance abuse treatment center, offered interviews and information about the challenges of dealing with substance abuse. Choices offers holistic options for addiction treatment. The Say Yes to Hope Beat Liver Tumors organization which aids in the fight against liver cancer was the charitable beneficiary for this event. While producer Durkin is well known for merging ecologically conscious brands with the luxury lifestyle, this was a special event – everything about the Eco Oscars party glittered and shone. Not one to rest on her laurels, she’s already planning her #RocknRolla event to celebrate the Movie Awards/Road to Coachella on April 8, 2015.